The LG G2 just went available for pre-order. It’s expected to arrive around September 27. The Nexus 4 was just released in India in May. The Nexus 4 can be found for around Rs. 23,000, and the LG G2 will likely start selling around Rs. 35,000. 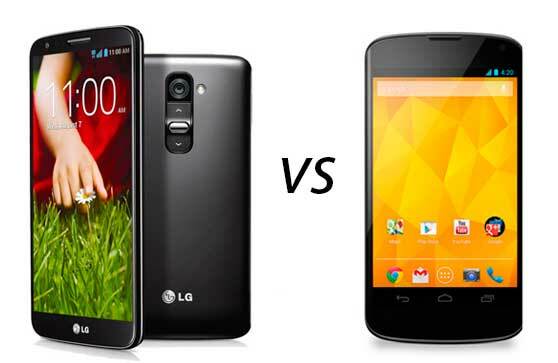 The LG G2 will be available in the standard black and white colours, both of which have a glossy texture. The device has a unique design with rounded edges and extra curves. Interestingly, the volume and power buttons are on the back of the device. LG hoped that this change would make the phone more ergonomic for users making calls. This feature will likely be hit or miss. The G2 is a 5.2-inch phone with a full-HD display, with a pixel density of 423 ppi. It has a Snapdragon 800 quad-core processor, clocked at 2.26GHz, along with 2GB of RAM. Users have a choice of 16GB or 32GB of internal memory. The LG G2 has a 13-megapixel rear camera, along with Hi-Fi audio playback. One downside is that the device doesn’t have a microSD slot, so users have to rely solely on internal storage. Lastly, the G2 will come with some nice software features, such as the ability to have a ‘guest’ account. This is a great feature for parents who wish to restrict access to certain apps from their kids. The Nexus 4 may have a sleeker design than the LG G2. Some think that the roundness and curves that the G2 offers is distracting. The Nexus 4 has a chrome bezel and some versions of it have a glittery back cover. The Nexus 4 has a slightly smaller screen, at 4.7 inches, with a resolution of 1280 x 768 pixels and a pixel density of 320 ppi. So, the LG G2 has more to offer when it comes to display. The display on the G2 is much crisper. The Nexus 4 has a Snapdragon S4 quad-core processor, clocked at 1.5GHz, and 2GB of RAM. Users can choose between 8GB and 16GB versions. The device has an 8-megapixel rear camera. Unfortunately, like the LG G2, the Nexus 4 doesn’t have a microSD slot. The Nexus 4 comes running stock Android, which many users, particularly advanced users, like. Sometimes the extra features on modified versions of Android make the operating system feel bloated. The Nexus 4 is still a great phone. If you don’t need to have the fastest processor on the market, you will certainly be satisfied with the device. Furthermore, the design of the Nexus 4 is sleeker, if that’s something important to you. Once the G2 comes out, it’s possible that the Nexus 4 will have dropped even lower in price. The G2 will certainly be one of the top phones on the market, but it’s made for a certain type of user. If you’re willing to try out the new button placement and software features, perhaps you should check this device out. The display and ultra-powerful processor make this device one of the fastest currently available in the market, and the niche software offerings are actually quite useful. Overall, the LG G2 is set to be a great device, and one of the best that is launched this year. If you are looking for a mobile that will last a good two to three years, you're better off getting the G2.